As we finish up our holiday shopping, it's easy to forget the finishing touches. Whether it's ingredients for Christmas Day brunch, wrapping paper for gifts or even a last minute present or two. We find ourselves frantically braving the mall on Christmas Eve, battling lines, and clawing out eyes over that last sweater or overpaying for a measly feet few of wrapping paper just to get the job done. One of the things I often overlook are the stockings. They looks so pretty and festive throughout the month of December. But it's not until the final hours that I look them over and realize, "Shoot! They need to be filled!" 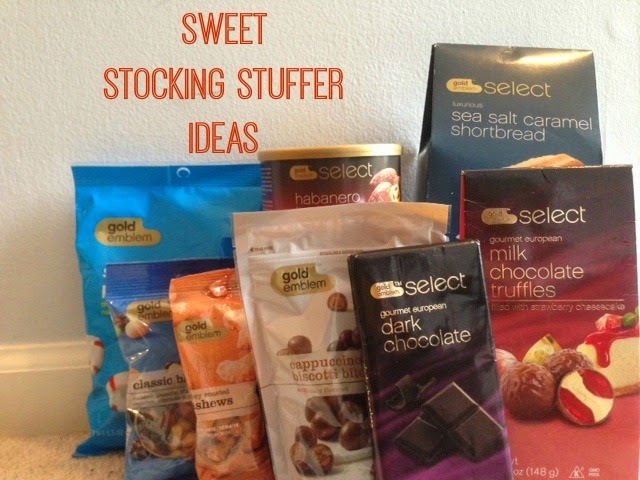 Luckily, we don't have to overthink stockings. My mom was awesome at keeping them simple and useful. She'd usually fill the stockings with every day items: toothbrushes, packs of gum, deodorant. I loved receiving the little things that I needed on a daily basis! But even better, my mom would always slip in a few sweet items, and that was always super welcome! If you have someone who loves bold flavors, check out Gold Emblem's Habanero Barbeque flavored almonds or the eye-opening Cappuccino Biscotti Bites. Sure to tantalize the palette! We've all got a few nutty people we love :) CVS offers a variety of trail mixes chock-full of nuts, as well as nicely-portioned packages of nuts like Cashews. Great to throw in a bag on the way to work or pack in a lunch! Who doesn't love a little cocoa? The Gold Emblem Select line has some tasty treats for those with a sweet tooth, from the Gourmet European Dark Chocolate Bar to the variety of filled Milk Chocolate Truffles. We'd all love to see a few of these items in our stocking! Nom nom nom! Pair these Sea Salt Caramel Shortbread cookies with tea, coffee or crumbled over some ice cream. YES! And for those who like to keep it simple, Soft Peppermint Puffs are a general crowd pleaser. Throw them in your purse or keep them in your car for a hint of freshness wherever you go. Disclosure: I’m proud to partner with CVS/pharmacy for the Gold Emblem and Total Home Prep for Holiday Entertaining campaign. I am being sponsored to help lead this campaign, but all opinions expressed are my own, and all product claims or program details shared should be verified at CVS.com or with the appropriate manufacturers.